This dictionary is a collection of over 6,500 words in the Bislama language. While it has been carefully checked for accuracy, there are no guarantees it is 100% correct. There are variations in how to spell many words and where there is a discrepancy we have used the reference "A New Bislama Dictionary" (2nd Edition) by Dr Terry Crowley to determine the correct spelling. This dictionary is copyright by the Government of Vanuatu, 2007. This dictionary is licenced under the GNU General Public Licence, version 2. This allows any one to freely use, distribute and make derivative works. See the GNU Public Licence for full deails of the licence conditions. Curriculum writers of the Vanuatu Community Certificate (Vanuatu Institute of Technology and the TVET Sector Strengthening Project). 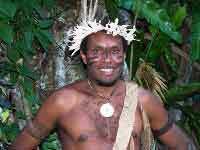 Supported by the Vanuatu National Language Council. Proofreaders and assistants: Dr Robert Early, Arthur Edgell, Angela Williams, Eddie Etul, Marian Loughman. Programming and Project Management by Daryl Moon. This was a great team effort - first, we extracted all the text from the Vanuatu Community Certificate teaching and learning materials (written in Bislama) and produced one large list of words. The list was sorted and duplicates and English words were removed. A couple of computer programs were then written in the Perl programming language to help identify new words. This was done by reading in a new document and comparing words to the existing list of Bislama words and a list of 120,000 English words. Any word that did not appear in the Bislama or English list was identified as a possible new word to be checked before adding to the Bislama list. A list of words was also received from the Vaunutu National Language Council and these words (which also contained a number of Bible words) were also added. A list of all village names and island names was provided by the Vanuatu Cultural Centre. A large number of abbreviations from various sources was also added. The Bislama list was then checked against the Bislama Dictionary by Terry Crowley (ref. above). Some experienced Bislama teachers and speakers checked the list of words as we found many words that did not appear in Crowley's dictionary. Finally, Dr Robert Early from the University of the South Pacific checked the entire list of words. Thanks to all those that helped!